I was recently extremely lucky to receive a box of scrumptious treats courtesy of HOOTS SNACKS. 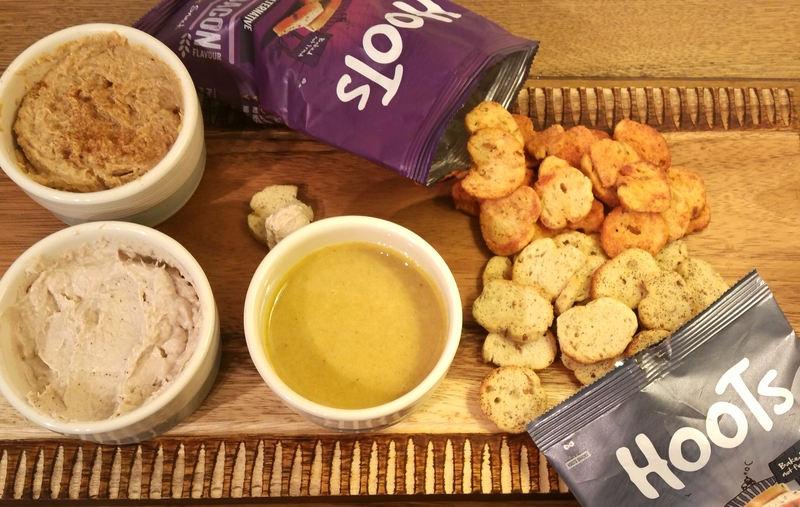 Hoots Snacks are a range of bite-sized bread-based snacks, perfect for eating just as they are straight from the packet or used as part of a canape or with dips. In fact, the list of ways to enjoy these snacks is endless! Let me tell you a bit more about them. They are available in 5 delicious flavours: Smoked Bacon, Cheese and Onion, Salt and Pepper, Pickled Onion, and Salt and Vinegar. The flavours are fairly strong but not too much, just perfect. They are a great source of fibre and contain wholegrain and seeds, which makes them extra yummy. They are baked rather than fried, and contain no artificial colours, flavours or preservatives, no nuts and no MSG. As they contain less fat, they are healthier than many potato-based snacks. They are suitable for vegetarians and vegans too. They are available in individual 35g serving packs or in larger 120g sharing bags. The smaller packs are perfect for lunchboxes for school or work, and are ideal for taking on days out for snacks. As well as eating them straight from the packet, they are ideal to use like croutons in soups, or broken up slightly and sprinkled over a salad. You can crush them up and use them like toasted breadcrumbs to coat chicken before cooking it. (I’m going to have to get some more to do that… I’ve only just thought of it but it would be soooo good with the flavours of these snacks). You can serve them with any number of toppings: smoked salmon, cream cheese, any cheese in fact, beetroot, pickles… the list goes on. They are amazing with dips too. We enjoyed ours with houmous and various homemade dips. The main picture at the top is Hoots Snacks with 3 of the dips I made. The top dip was based on my love of Coronation chicken. I put cooked chicken breast, mayonnaise, mango chutney, curry powder and a dash of tomato puree in a food processor, and blitzed it all together. It was a lovely mix of sweetness and spiciness. The bottom left dip was my son’s favourite. It was super easy to make. I just mixed together tuna, cream cheese and a tiny bit of mayonnaise, until it was smooth and creamy. My son ate a whole packet of the snacks to himself with this dip! The last dip in that picture was homemade tahini. I blitzed together toasted sesame seeds, garlic, rapeseed oil, lemon juice, ground coriander and turmeric until the mixture was smooth. 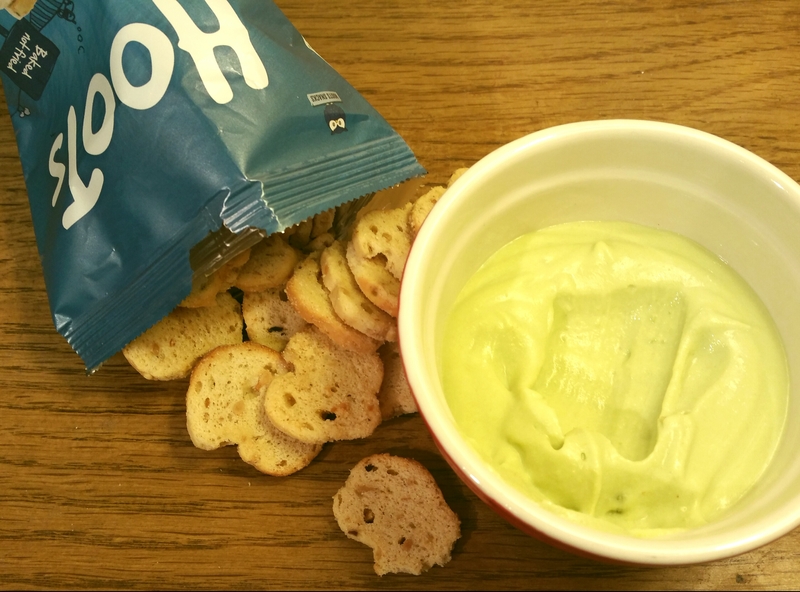 I did make one other silky smooth dip for them… I blitzed peas, garlic and cream cheese together for a really light refreshing dip. We also enjoyed the snacks with a delicious baked Brie. 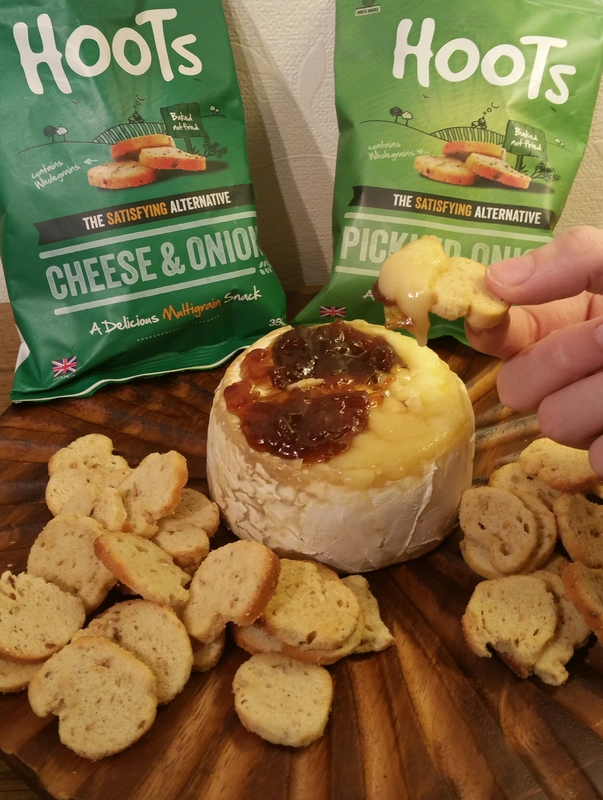 I baked the Brie in the oven for 10 minutes, cut the top crust off and added a spoonful of caramelised onion chutney. The warm gooey cheese was the perfect accompaniment to the crunchy snacks. There is only one problem with Hoots Snacks. They are so exceptionally moreish (you have been warned) but not yet available in supermarkets. But don’t worry, there are many online places to buy them from. Click on THIS LINK to see where you can get them. How will you eat yours? Straight from the pack, or with dips and toppings… or can you think of another way? I’d love to hear from you. DISCLAIMER: I received these snacks for free from Hoots Snacks. This in no way affects my views on them though. I don’t believe in giving false reviews. My entire blog is based on honesty. I only recommend products or services I genuinely liked, and Hoots Snacks are definitely something I like!! !